What effects might artificial intelligence, the sharing economy, and other disruptive technologies have on government revenues? A new Mowat Centre report examines how taxation systems based on residency are ill-suited for a digital, global economy. Recent years have witnessed rapid growth in technological innovation, from the proliferation of sharing platforms such as Airbnb to the advent of blockchain and recent advances in artificial intelligence and big data. The potentially transformative impacts of these technologies for both workers and regulatory frameworks have been well documented. Less attention has been given to how these developments might impact government tax revenues. Funding for core public services is primarily derived from revenues collected from personal income taxes, sales taxes, corporate taxes, and payroll taxes. This tax base is likely to come under increasing pressure in an environment of global superstar firms with relatively few employees that are headquartered abroad, and global labour platforms that could upend the compensation model of a variety of key service sectors. 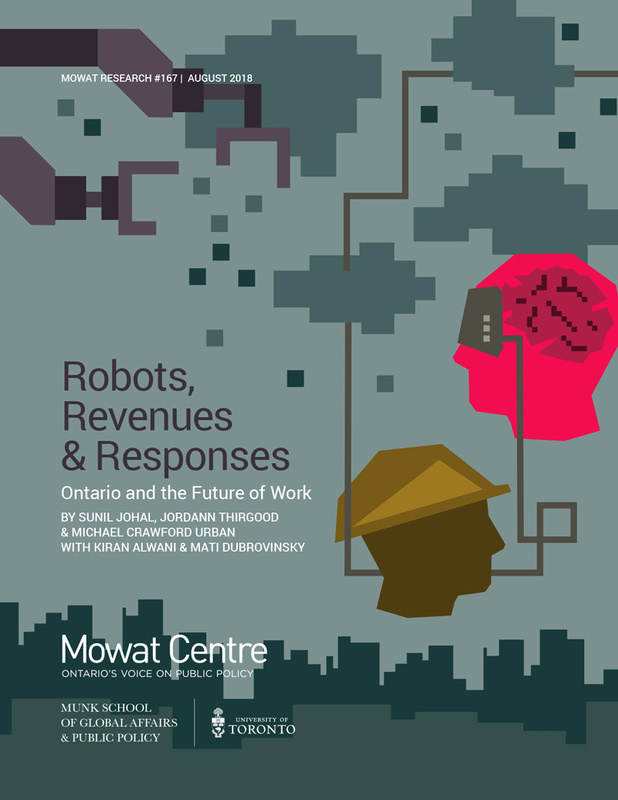 Robots, Revenues and Responses: Ontario and the Future of Work outlines key macroeconomic, labour market and technology trends, and the state of Canada’s social architecture. The report also explores how these trends interact with the primary sources of government revenue. Four plausible future scenarios based on the rate of technological disruption and degree of institutional response are developed as a starting point for consideration of next steps. The report concludes by presenting a number of policy options that governments may consider in response to this uncertain future, ranging from how to ensure revenues are collected effectively, to innovative partnerships with business and modernizing service delivery frameworks.